MILWAUKEE (AP) — The Milwaukee Brewers used a power surge to maintain their strong start and keep the Chicago Cubs reeling. Facing off for the first time this season on Friday night, the Brewers outslugged the Cubs 13-10 in an early season showdown of teams already heading in opposite directions. Ryan Braun and Eric Thames hit three-run homers and the Milwaukee Brewers connected five times in all to send Chicago to its sixth straight loss. Hernan Perez, Yasmani Grandal and Orlando Arcia also homered for the defending NL Central champions, who improved to 7-1. They have won nine of their last 12 games against the Cubs, including the division tiebreaker last season. 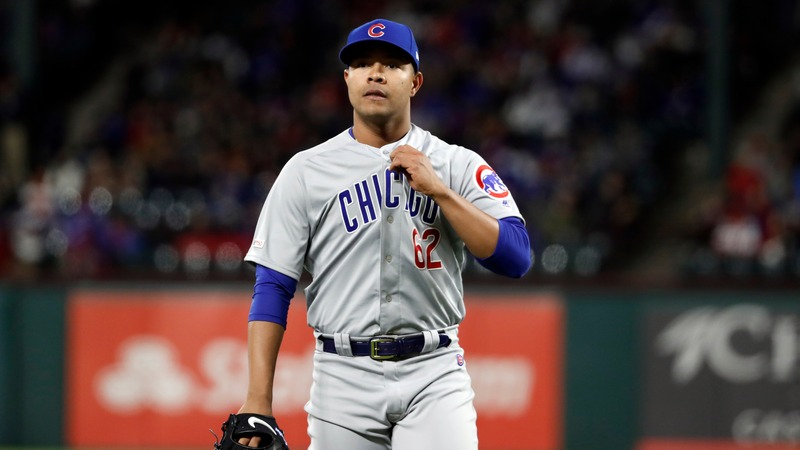 Jose Quintana, who had dominated the Brewers over the past two seasons struggled by laboring through a 32-pitch first inning in his first start of the season. "I think they really ambushed me tonight," Quintana said. Quintana had a 4-1 record with a 2.13 ERA against the Brewers last season. In 11 starts against Milwaukee coming into the game, he was 6-2 with a 1.62 ERA. "We were laying off the inside pitches that we always swing at," Perez said. "We were patient and put good swings on strikes." Jason Heyward, Daniel Descalso and Willson Contreras homered for the Cubs, who fell to 1-6. Milwaukee wasted no time getting to Quintana (0-1), with Christian Yelich hitting an RBI double in the first and scoring on Braun's single. Braun homered in a four-run second, and back-to-back home runs by Perez and Grandal made it 8-0 in the third. "We've struggled scoring against (Quintana)." Brewers manager Craig Counsell said. "I thought (hitting coach) Andy (Haines) gave the guys a really solid plan today and they followed through on it." Quintana gave up eight earned runs, tying a career high, and eight hits and three walks. "They weren't missing anything," Cubs manager Joe Maddon said. Descalso hit a three-run homer off Milwaukee starter Brandon Woodruff in the fourth and Kris Bryant added an RBI double in the inning. Chase Anderson (1-0) allowed one hit in three innings. Arcia extended the Brewers' lead to 10-5 with a two-run homer in the fifth. Thames made it 13-5 with a pinch-hit drive in the seventh. __TRAINER'S ROOM__ Cubs: C Contreras stayed in the game after being hit in the ribs by a pitch from Woodruff in the fourth. Brewers: RHP Jeremy Jeffress (sore right shoulder) gave up two runs and two hits, including a home run, in 1 1/3 innings in a rehab assignment for Triple-A San Antonio at Oklahoma City on Friday. __MISUNDERSTANDING__ After being called out on strikes to end the third, Cubs shortstop Javier Baez flung his bat then slammed his helmet to the ground. Plate umpire Jordan Baker pointed at Baez, who then stormed toward Baker, mistakenly thinking he had been ejected. "(Baker) was just telling him to quit throwing the equipment," Maddon said. __ON THE MOUND__ Shirley Ollman, an avid Brewers fan celebrating her 100th birthday, threw out the first pitch. Christian Yelich greeted Ollman, who resides in the Milwaukee suburb of Glendale, before family members escorted her to the mound, where she made a soft left-handed toss to Brewers bullpen catcher Robinson Diaz. __SLUGGING PITCHER__ Woodruff, who had two hits in two at-bats coming into the game, drew a five-pitch walk that helped spur a four-run outburst in the second inning and singled in his only other at-bat in the third. "It's pretty important to just go up there, battle and make the pitcher work," Woodruff said. __BUCKS SUPPORT__ Milwaukee Bucks players Malcolm Brogdon, Brook Lopez and Pau Gasol attended the game. __UP NEXT__ Cubs: Cole Hamels will take the mound for the second time this season on Saturday. He gave up five runs in five innings on Sunday at Texas. Hamels is 7-3 with a 3.60 ERA in 15 starts against the Brewers. Brewers: Corbin Burnes will make his second start of the season on Saturday. Burnes had a no-decision in his first career start on Sunday against St. Louis. He gave up four runs and six hits, including three home runs, in five innings while striking out 12 and walking one.